SOUTH Fremantle has the chance to make it six straight victories and earn a spot in the 2018 WAFL Grand Final up against Subiaco in Sunday's second semi-final at Leederville Oval. Subiaco and South Fremantle do battle on Sunday afternoon at Leederville Oval in the second semi-final with the winner to advance to the 2018 Grand Final at Optus Stadium in two weeks' time. 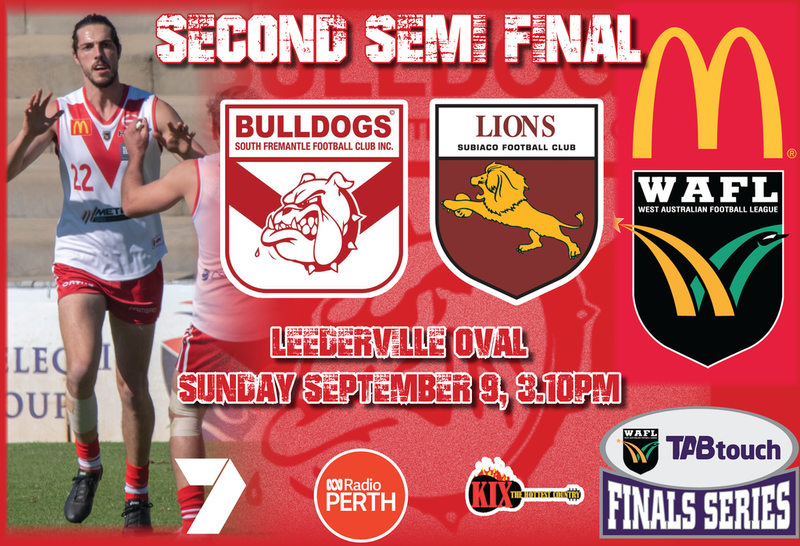 There will be a second chance for the loser who will go on to host the preliminary final next Sunday too against the winner of Sunday's first semi-final between West Perth and Claremont, but neither the Lions or Bulldogs will be thinking about that heading into the second semi-final. Subiaco comes into the game on the back of an undefeated season becoming the first club to do that in the WAFL since 1946 with the Lions earning a break last weekend when the WAFL Finals Series got underway. South Fremantle finished the season in second position on the ladder with a four-match winning streak and the Bulldogs kept that momentum going last Saturday with a 98-point hammering of West Perth in the qualifying final at Fremantle Community Bank Oval. The motivations remain high for both clubs heading into the contest as well which only serves to make it all the more tantalising. Subiaco has been the dominant team in recent years having now won four successive minor premierships on the back of winning the flag in both 2014 and 2015, and then losing Grand Finals the previous two years to Peel Thunder. Sunday now provides the Lions with the opportunity to reach a fifth straight WAFL Grand Final but also the chance at redemption for those two losses the past two years after they have been minor premiers and the standout team of the home and away season. But for South Fremantle, 2018 is now the third year they have finished the home and away season in second position on the ladder with each of the past two seasons ending with preliminary final exits. Sunday's game provides the Bulldogs with the chance to qualify for a first Grand Final since 2009 as they attempt to win a first flag since that same year when they did beat Subiaco in the premiership decider denying the Lions a fourth consecutive flag. 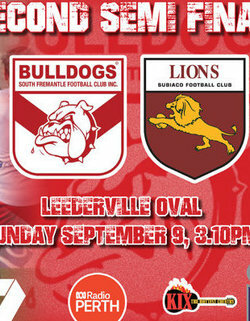 Subiaco and South Fremantle have met twice during the home and away season with the Lions winning by 58 points at Fremantle Community Bank Oval in Round 2 and then holding the Bulldogs to three goals in Round 15 at Leederville Oval to win by 10 goals. South Fremantle did beat Subiaco back in Round 1 of last year by 39 points at Fremantle Community Bank Oval, but the Lions have since won four on the trot by an average of 47.3 points. Considering Subiaco has played in four straight Grand Finals and won four consecutive minor premierships now, it's no surprise that the Lions have had the wood over the Bulldogs now having won 10 of the past 11 matches, and 14 of the last 17 meetings. Even going back since South Fremantle beat Subiaco in the 2009 Grand Final, Subiaco has had it over the Bulldogs winning 19 of the 25 match ups. They have played in three finals since that 2009 Grand Final too with Subiaco winning the 2011 first semi-final by 85 points, second semi-final in 2016 by 40 points and preliminary final in 2017 by 32 points. 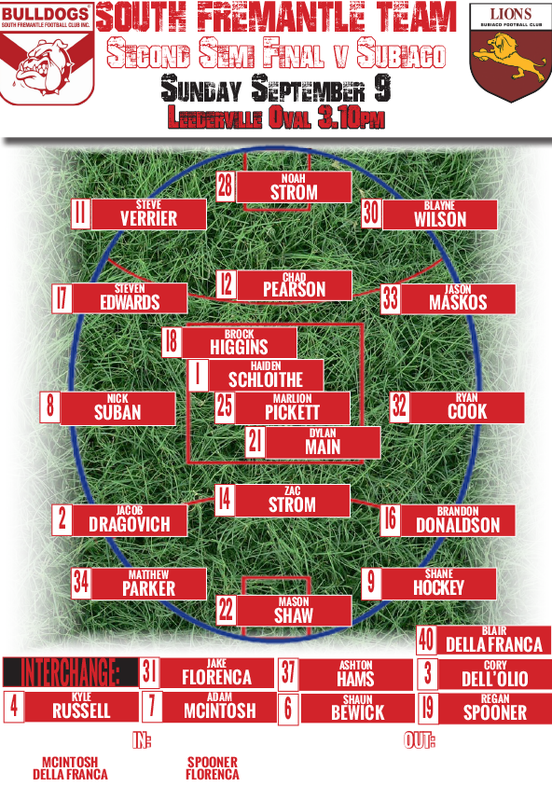 South Fremantle coach Todd Curley is confident his team is ready for the challenge of Subiaco. "You pick up little things every time you play teams and I think the biggest area of learning for our guys in the last six to eight weeks has been more about ourselves, and learning about each other and your teammates and what you have to sacrifice to be a good team and win," Curley said. "We'll take the little things we've learned about ourselves and against them, and we'll recover well, train well and prepare well to give it our best crack." South Fremantle is now in its best run of form of the season having won five straight matches including last week's 98-point thumping of West Perth while also the healthiest with only triple Bernie Naylor Medallist Ben Saunders unavailable with a knee injury. The key to the Bulldogs winning these past five matches and looking so impressive has been the full contribution they have been receiving from all 22 players. That means that breaking into the team now from last week to this week has proven an impossible task with Blair Della Franca named an emergency as cover for Brock Higgins with Adam McIntosh and Jake Florenca hoping an opportunity opens up as the other two emergencies. Subiaco went through the season undefeated and was guaranteed of the minor premiership and a home second semi-final long ago, but the selection of a final 22 for the Lions come finals time was always going to be fascinating. That's certainly been the case with settling on a 22 when realistically Subiaco has 30 players deserving of a spot in the side far from an easy task for Jarrad Schofield and his coaching staff. Subiaco's colts and reserves have both finished as minor premiers too to earn home second semi-finals so depth is anything but a problem with the Lions, but selection was a challenge for the league side. Some tough calls had to be made with the toughest for sure to leave Brad Stevenson out of the side and he will play in the reserves second semi-final also at Leederville Oval on Sunday against East Perth. Stevenson had kicked 27 goals this season up to the end of Round 11 but has managed only three games for two goals since. The Lions have elected for Ryan Borchet in the forward-line instead and the second semi-final will be the eighth league game of his career. Ben Newton also returns for Subiaco at the expense of Tom Edwards-Baldwin who had been in impressive form kicking 15 goals in his seven appearances. The other change for Subiaco was Greg Clark returning for Michael Braut but the positive is those that missed selection can still press their claims in the reserves.